Something you can look forward to with Our Adventure Continues, as early as next week, are Super Heroes. Wait a minute? Super Heroes? I thought Our Adventure Continues was going to be a silly web strip about two losers trying to create comic? Well, it still is, but at the same time, it isn't. 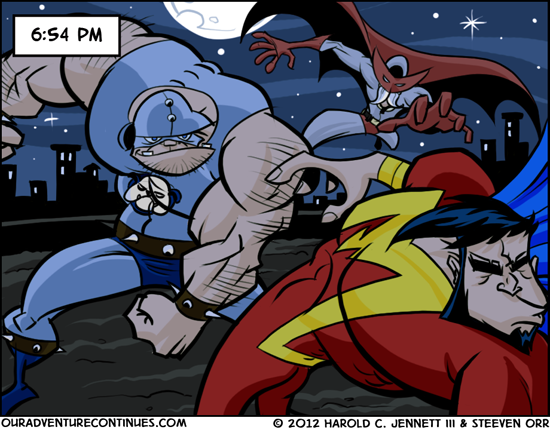 First off, the strip is still coming, we’ll get to that once we tell this super hero story. See, once this story is over, Our Adventure Continues ... just in a different way. Sort of like life. The story you will get starting next week, which is called Priorities, is something that Harold and I put together for an anthology that sort of fell through. In the meantime, we started work on the strip, but we wanted to be thirty strips ahead before we launched. At this point, we have twenty strips in the can and are furiously working on more. Yet, we had this eight page story, a story both of us are really proud of, just sitting there collecting digital dust. So we decided to give you some real content each week while you wait for the strip. Don’t worry though, all in all it does connect in a fashion. The strip is about us creating comics, Priorities included. And frankly, this is what we want to do with the web comic ... Which is, whatever the heck we want to. If we want to post an eight page super hero story, then post a bunch of 4 panel strips about two guys being silly for the next six months, then post a western version of Monty Python’s Holy Grail in comic form, well … we will, because after all, once one story ends, Our Adventure Continues along another track. What this means is that the site officially launches next week. Once Priorities is complete, Our Adventure Continues with a web strip about a couple of dudes making a web comic. Try not to think about it too much. We don't.